Part of Southeastern's fuel rewards promotion; see the full ad below. Southeastern Grocers is ushering in a new customer rewards program as Plenti, the coalition loyalty program it joined last year, winds to a close. 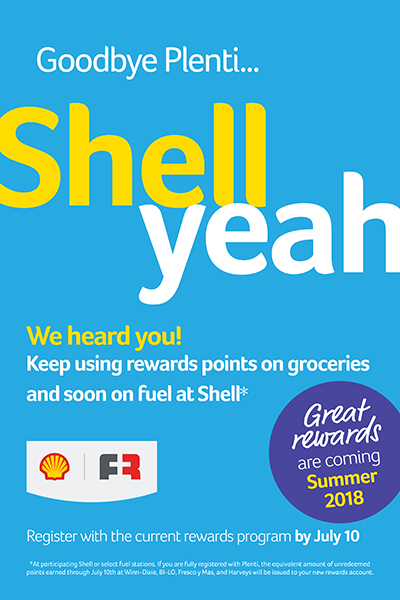 Due out this summer is SE Grocers rewards, which will enable customers of Bi-Lo, Fresco y Más, Harveys Supermarket and Winn-Dixie stores to redeem points on groceries and fuel at participating Shell or other select fuel stations, Southeastern Grocers said Monday. The retailer has partnered with Shell Oil Co. and Excentus Corp., a specialist in loyalty program design, development and implementation, for the new rewards offering. The Plenti program, which stopped accepting new enrollments April 16, is scheduled to end on July 10. Southeastern Grocers said its customers can continue to earn Plenti points at its stores through that date, and the unredeemed points value will be carried to SE Grocers rewards and become available when that program launches. Southeastern Grocers noted that customers must be fully registered to use Plenti points now or transfer them to the SE Grocers rewards program. They can check the status of their enrollment at bi-lo.com, frescoymas.com, harveyssupermarkets.com or winndixie.com. "We will take every step to ensure this transition is clear, smooth and creates quality value and savings for our customers and associates where it matters most: food for their families and fuel for their vehicles,” Hucker added. Southeastern Grocers rolled out the Plenti program across its supermarket banners last April following a pilot in Harveys Supermarkets launched in the fall of 2016. The company was the first grocer to join the American Express-operated coalition loyalty program, launched in the spring of 2015. Described as the first U.S.-based coalition loyalty plan, Plenti enabled consumers to earn and redeem points for purchases at all of the participating companies. Besides American Express, Plenti’s inaugural partners included Rite Aid, Macy’s, ExxonMobil, AT&T, Nationwide, Direct Energy and Hulu.